Bolt Action | Glory Eagles de l'Empereur! Just a quick photo-update of a couple of games I played recently. The first is a Bolt Action game in which Markus absolutely destroyed my Gerbil Herders, the second is a Maurice game in which my Marlenedietrichsteiners took out Ernie’s dastardly Rastenbergers. First up, my massive Bolt Action defeat! Just a quick photo-update post showing a couple of games from a while ago that I never got around to posting. 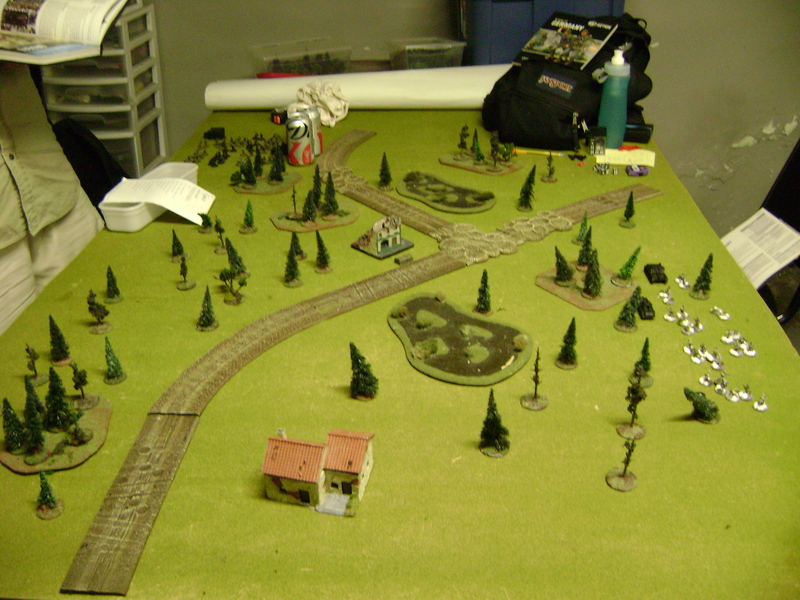 First up is my great defeat to Markus’ Russians (depicted here on Markus’ blog). Second up is my victory over Ernie’s Rastenbergers for our Maurice campaign (in-character write-up found here). Set up, Gerbil Herders on the right, Russians on the left. I managed to get another couple of games of Bolt Action in at the club last night against Ernie, who was trying out a new US Rangers list. I used my usual 500 point force (Veteran 2nd Leutnant, 4 squads of 6 veterans with AR), and Ernie had a variety of units – a large veteran unit with some SMGs, a BAR and LMG, a large regular unit with SMGs (and BAR and LMG? I think at least one of those options anyway), 2 MMGs, a 2nd Lieutenant and aide, and a medic. We set up the first table using another couple of pieces of our megagame table, and rolled for scenario – Maximum Attrition. The goal in this scenario is simple – destroy the enemy. 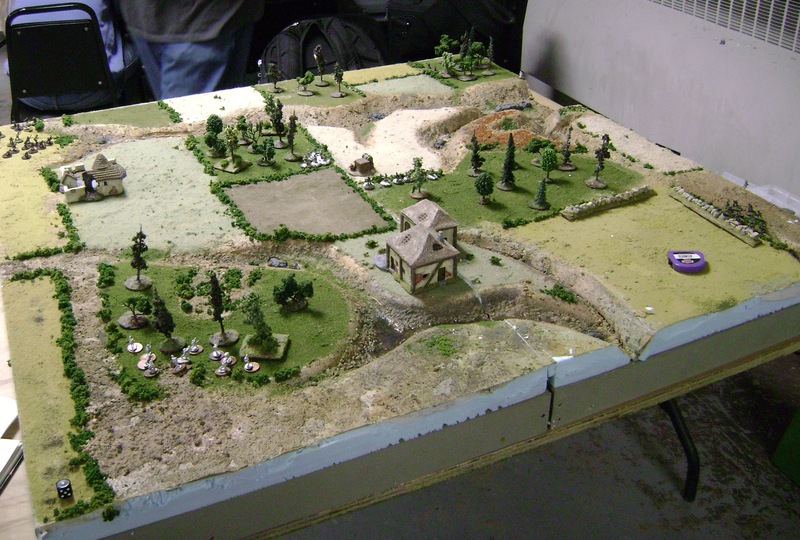 Managed to get in two games against Markus last night, we’d arranged to play Bolt Action and because we got started early, we easily had time for two games, so after the first one we switched roles and played the same scenario on the same table, something that’s always fun to do. Markus had set up a great looking table before I arrived, and we rolled for the scenario – 4: Hold Until Relieved. I played the defender, with my usual 500 point list of a veteran 2nd Leutnant accompanied by 4 squads of 6 veterans all armed with Assault Rifles. Markus had a 1st Lieutenant with aide, a PTRD AT rifle, medium mortar, a couple of units of regulars with LMG, a large unit of rookies (with LMG?) and a pretty hefty unit of veterans, partially armed with SMG if I recall correctly. Sometime later today, Markus will undoubtedly be posting a batrep to his blog, which if you aren’t already reading, you should be (even if it does verge into fantasy wargaming instead of proper historical wargaming from time to time 😀 ), so you can check against that to see his list. My other units were part of my first wave (1 more unit) and reserve (my last unit and commander). [Bolt Action] Gerbil Herders reign supreme! 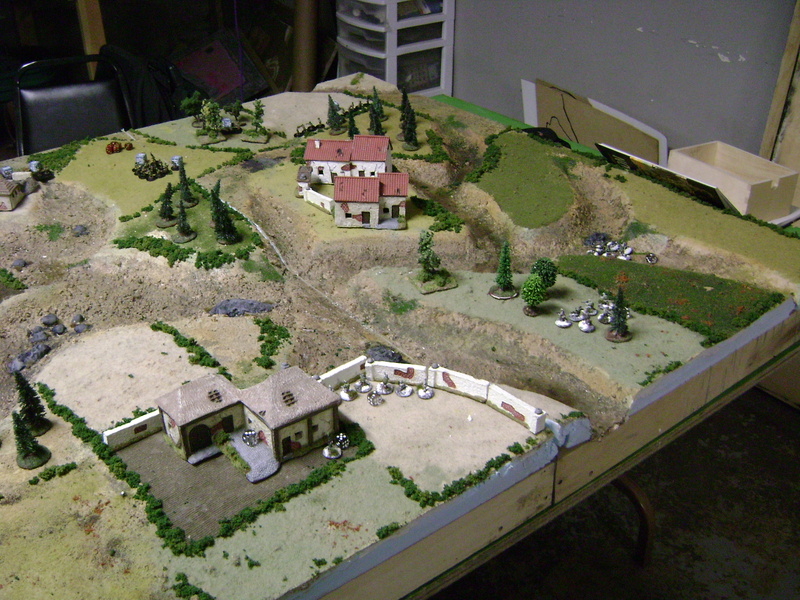 My Gebirgsjaeger took on Ernie’s Yanks last night at the club, using the new Bolt Action rules. I toyed with the idea of swapping out a couple of teams with my Puma, but since we were sticking with 500 points, I went with my usual list of a 2nd Leutnant with four squads of 6 veterans, all armed with assault rifles. They work pretty well, since they can fire and move without penalty so they’re good in the attack as well as the defence, and they’re excellent in close combat. The only danger is that there aren’t many squads (and so fewer dice in the pot), and that they’re small squads too, so can easily be forced to rout with a couple of casualties. Still, being vets helps. Setting up the table. 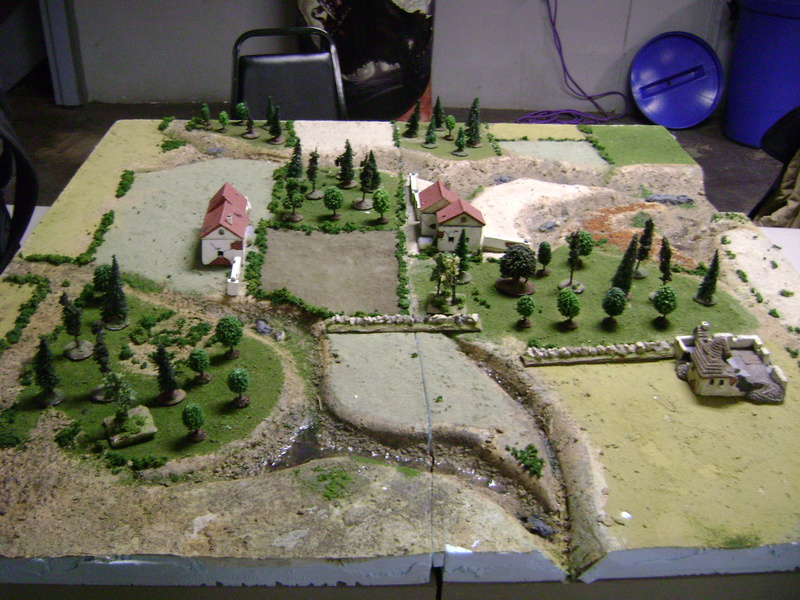 My objectives were placed below the ruined building, next to the wall in the middle, and in the patch of rough ground in front of the woods to the left. Since we decided at the club to do some Bolt Action using 15mm figures (we may end up doing some 25mm too, it’s just that it’s a lot quicker to paint up a load of 15mm figures than 25mm ones, as can be seen by our rather slow progress getting out Saga forces done), I thought about what I’d like to do. I have a few spare US Paras from my FoW force, so thought about doing them, and might get around to it one day, but I wanted to do something I haven’t already got in one scale. If we do 25mm some day I’ll be using Polish Airbourne, so the Brits were out since they’re classed as British airbourne. That left Russians and Germans of the main belligerents, and the larger number of figures needed for a Russian force combined with the fact that the German army list book was coming out way before the Russian one meant Germans were the more likely candidate.